I've been working on a few Halloween projects this month. This little quilt measures 14" square. The half square triangles are 1 1/2" finished. I made them from leftover 5 inch squares from another project. Sew 1/4 inch on both sides of the diagonal lines (where I have drawn the red lines). Cut down the center vertically. Cut down the center horizontally. Now cut these four squares diagonally where I have drawn the black lines. You have 8 half square triangles. You can also draw the lines on the back of the light square and cut your charm squares in half once before sewing any of the lines. That way you can mix the darker squares to get more variety in your half square triangles. I started out making broken dishes blocks for this little quilt but since there would be an odd number of blocks, I just made a few of these and then filled in with half square triangles. It wasn't quite what I had planned, but it gave the quilt a more scrappy look. White chocolate candy corn M & Ms.
so a sweet wallhanging, and the colors are bright. What cute Halloween projects! 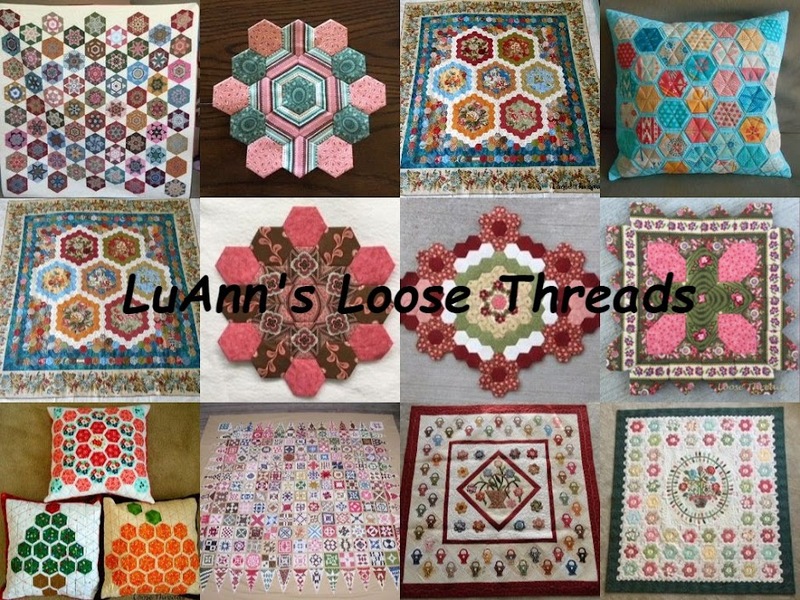 And a clever method for making the HSTs, LuAnn. What a pretty little halloween quilt. I bet the bowl with candy is empty already, right? So pretty! It is always nice to e reminded about all the nifty techniques we knew once and then forgot. I love your projects! You have been very productive. Candy corn M&M's??? Oh my gosh...I have to find some of them for myself! (I like your table topper too! What a cute mini! I love the scrappiness of it! It may not be new, but you explain it very well and the pictures are great. I see these things on the web and forget where. Now I know where to go when I need to do this. Love your little quilt. hello LuAnn, I just found your blog and I like it very much. All your projects are so pretty and I love it that you explain your techniques so we can have a try ourselves. I didn't notice your header photos properly when I visited before, but I just set eyes on your amazing fall quilt. I am just blown away by it, I would never want another quilt in my whole life if I could make that one (I promise!). Thanks for the tutorial. The candy apples look yummy. Looks like a trip out to find those M&M's will be on my to do list! Darling little quilt. I am in love with the binding! Wonderful Halloween projects LuAnn! As always - I LOVE your tutorials, this is a great one too! Don't you just love those bonus projects! It looks terrific. I just saw those M&M's in my local CVS and had to buy them. Kind of on the expensive side -- but they are some kind of good (and I am not a big fan of white chocolate)! Would you mind telling the pattern name for the other little quilt? It is adorable as well. Very pretty (or should I say ghoulish?!) use of Halloween fabric. There are candy corn M&Ms????? Great project LuAnn lovely, bright and cheerful. OMG this is adorable, you chose just the right halloween fabric for this....I love this little quilt! ok I may need a bag of those m and m's! Thanks for the great tip on the HST..I didn't know that one. Cute little project too, and a great ide for leftover squares or any size.